As emotionally charged as it is technically impressive, the Spanish art of flamenco marries song, dance, and rhythm under one unique musical tradition. Flamenco performances combine these elements to create a single impassioned expression, which is both highly performative and deeply personal. Though it is most often considered Spanish in origin, flamenco stems more specifically from the southern regions of Andalusia. Its unique free-spiritedness grew out of the interplay of several different cultures, including Andalusian, Islamic, Sephardic, and Gypsy. There is much disagreement among scholars over flamenco's beginnings. Some argue that the Gypsies initiated and maintained the underground art form prior to its earliest documentations. Others say this is only a myth. Much of this dispute can be attributed to the fact that flamenco began to spread throughout its native country of Spain during times of political and social unrest - namely, the Spanish Inquisition. As a result, little documentation exists regarding the arts and their development. Regardless of its true origin, flamenco became a thriving subculture in Seville, Cádiz, and Málaga. Throughout its history, the flamenco tradition has seen much ebb and flow. In the late 18th century, it saw its first heyday with the popularisation of 'flamenco fiestas', or days-long social gatherings that followed a strict etiquette. Many argue it was here that flamenco was truly born. From 1869 to1910, Spain saw the 'Golden Age of Flamenco'. During this period, dancers became a major public attraction and guitarists began earning reputations. Additionally, music cafes, where flamenco was performed, became widely popular. From 1892 to 1956, flamenco entered a 'theatrical period', in which economic interests began to trump authenticity and for many, the art form became a commercial venture. Since that time, flamenco has struggled to stay true to its roots, often succumbing to the demands of entertainment and tourism. 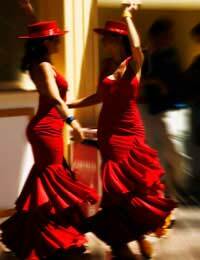 The three essential parts of flamenco are the 'toque', or guitar music, the 'cante', or the song, and the 'baile', or the dance. Though the song, both poetic and rhythmic, is considered the heart of the performance, the dance is the most visually engaging and physically trying aspect of the art. Flamenco dance is traditionally done by a solo performer using sweeping arms, stomping feet, and accessories such as long skirts, flowing shawls, castanets, and a large folding fan. From a technical perspective, flamenco dances include a strong and centered posture, percussive noises with heels and balls of the feet (zapateado), powerful arms with rounded elbows, and a constant turning of the hands inwards and outwards. The most important and perhaps impressive element of the dance is that it is entirely improvised. Flamenco dancers (or bailaores and bailaoras) wait patiently at the beginning of a performance to absorb the atmosphere of the room, taking in the beat of the music and the impassioned clapping of the audience. When they feel inspired by their surroundings, they begin to dance. They wait for what is called the 'duende', or the internal force that lights the fire beneath a spirited performance. Dancers must be highly skilled before embarking upon an improvised performance, since depending upon the songs played by the musician, the meter of the music may be a simple 3 beats, a more difficult 4 beats, or an advanced 12 beats with a mix of alternative and atypical bars. Much technical proficiency is required to master flamenco dancing, but that doesn't mean that the art form is in any way inaccessible to beginners. That's because while the physical execution of the dance form can be learned over time and with practice, the most important part of flamenco dancing is the passion and commitment of the dancer. The flamenco dancer's greatest challenge is creating an authentic and organic experience for everyone present by channeling the power of the music through his or her own body. This is what makes flamenco an intensely personal and unique movement style. For this reason, the art itself will thrive as long as individual dancers and musicians remain dedicated to its long history and rich traditions.